RockTape A WINNER AT RECENT WORLD TRANSPLANT GAMES! 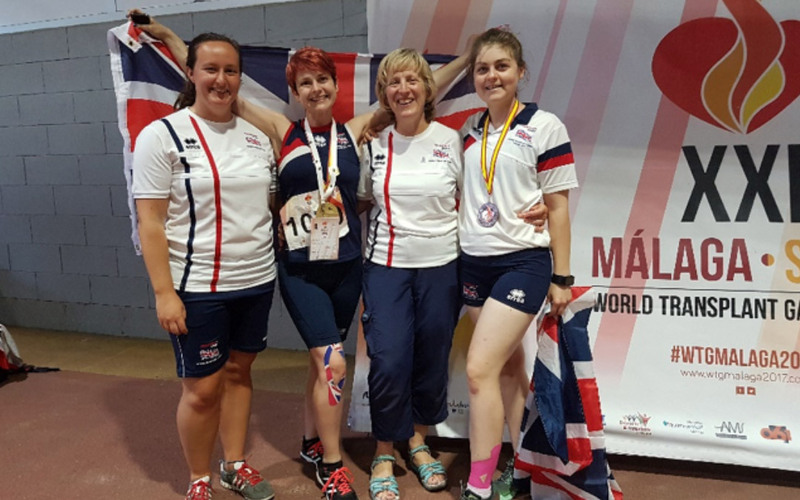 The recent World Transplant Games in Malaga, Spain, resulted in an outstanding performance by the British team who came home with a total of 360 medals – 166 of them Gold! The Team also won the award for the outstanding team of the Games which measures medals per competitor. Alison Bloxham has been providing Physio support to the British Team for 16 years now and along with her team of Physios and Sports Therapists this year were looking after 175 athletes (including 20 Juniors). The World Transplant Games is the 3rd largest international multi-sport event after the Olympics and Paralympics but does not receive any of the Government funding associated with the big 2. As a result, all the athletes and the Management team must raise the funds to attend and the Physio support is no exception. All of the costs for the Physio team was raised through public fund-raising efforts and kit sponsorship was a key part of this. In 2015, a chance conversation between Paul Coker and Alison (who already used RockTape in her private practice in Kendal) led to Paul kindly offering to donate some UK flag Rocktape and over the past 2 years she has utilised this at both National and International events. This year the Team used more than ever as the skills of the Physio team in taping has improved and the athletes have become more and more informed about its use. Not only do the athletes love the UK flag motif but they are also more and more convinced of its efficacy and those who initially dismissed it as a bit of “fad” are now realising the benefits. Not only the athletes are loving it but the other international Physios travelling with their own teams were keen to find out about Rocktape. One Physio from New Zealand was disappointed in the fact that the k-tape she was using wouldn’t stay on properly as it was so hot and the athletes were sweating so much. The British Team had no such problems with RockTape! Thankfully the UK motif meant they didn’t get asked to supply the other Teams! One of the outstanding athletes who benefitted from Rocktape, Steve Jarvis, lives close to Paul in Cornwall. He had a complex back problem which manifested itself in hamstring type pain where there was no clinical hamstring injury. After treatment for neural issues and despite full hamstring function he continued to feel inhibited by a “cramp-like” sensation as if the hamstring was going to tear at any moment. Alison speculated that the tape might alter the proprioceptive input from the hamstring which was experiencing a sciatic pain memory from his previous problems, and utilised the tape to inhibit hamstrings with dramatic results! Not only did Steve race pain free, but went on to win 6 Gold medals and break 4 World records and all without pain! Another Gold medal winning athlete, Sue Bennett had been dogged by anterior knee pain prior to going to Malaga and offloading the patella with Rocktape produced another Gold medal winning pain free performance! Moray Laing was unlucky enough to suffer a groin strain during the Golf competition earlier in the week and after daily treatment had RockTape applied on competition day to facilitate his adductor function and achieved a Gold medal in the Javelin. Each participant is a living example of the success of organ transplantation and the celebration of life, which is central to the Games. Anyone looking for some real life super heroes should look no further than those who make up Team GB. Every one of these amazing athletes is a successful transplant recipient at their peak of physical fitness, enabling them to compete and win at the World Transplant Games. Transplant Sport is a charity which organises sports and social events for transplant recipients in order to highlight the benefits of organ donation and prove that you can lead a normal and active life again after transplantation:www.transplantsport.org.uk. The Games aim to demonstrate the benefits of transplantation, encouraging transplant patients to regain fitness, whilst increasing public awareness of the need for more people to sign on the NHS Organ Donation Register, as well as the Anthony Nolan Bone Marrow Register, and discuss their wishes now with their families. To join the NHS Organ Donor Register and help save lives call 0300 123 2323 or visitwww.organdonation.nhs.uk.